This beautiful mother to be had a wonderful maternity session. 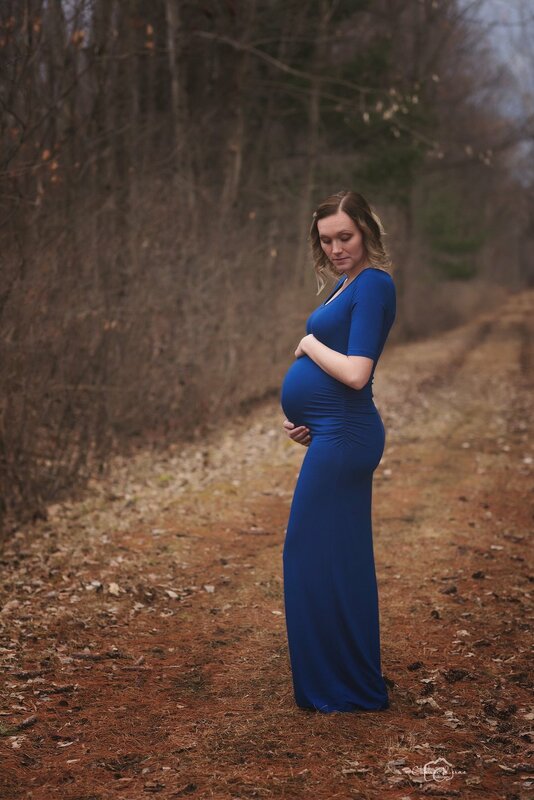 She was glowing in her vibrant blue maternity dress during her outdoor session. I love the bold colors of her maternity gowns against the changing seasons in the background. Maternity sessions can include indoor boudoir type images and/or outdoor images. I love the simplicity of the white background with mother to be dressed in lace. The whimsical setting is perfect to focus on mother and her baby bump. Maternity sessions include 30-40 finished edited images. To book your maternity session click here. Maternity sessions are a great way to celebrate your pregnancy. You can share these photos with friends and family members or keep them for yourself, to remember this special milestone in your life. You can view my online maternity gallery here. I love the sweet emotions of a maternity photo session, all the wonderful anticipation and excitement waiting for baby to arrive.